WARRINGTON – Gloria J., 72, of Milton, Queens County, passed away peacefully in Queens General Hospital, Liverpool on Sunday, December 22, 2013. Born in Liverpool , she was a daughter of the late Eugene and Charlotte (West) Wolfe. Gloria worked at Dominion Stores and New System Laundry. She enjoyed bowling, darts and dancing and was a “professional” bingo player. She was a life member of the Ladies Auxiliary , of Mersey Branch #38, Royal Canadian Legion, Liverpool. Above all, she loved her grandchildren and she loved to laugh. 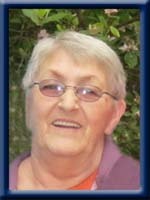 She is survived by her daughter Crystal (Irvin) Miller of Creston, BC, her son Murray of Milton. Her grandchildren Morgan (Laura), Melanie (Brad), Murray and Jared. Her great grandchildren Brody, Aislin and Kylar. Her sister Margie (Reginald) Marshall of Annapolis, her brother Bert (Edith) of Mersey Point. She was predeceased by her husband Murray. Condolences to the family of Gloria Warrington. Condolences to brother Bert Wolfe and family. So sorry to hear of your loss at this time. You are in our prayers. Lean on each other and your friends during this difficult time. Our hearts are heavy at this time. Gloria was a friend. Murray you know we are here for you, the boys will be looked after from above. murray and family sorry about your mother. she will be missed around the legion. she will also be missed at bingo. take care and we are so sorry .our prayers are with you this time of sorrow. Dear Murray, So sorry to hear of your loss. Always liked chatting with your Mom….nice lady…and yes indeed…she loved to laugh. Murray: We were sorry to hear about your mother. Our thoughts and our prayers are with you. Murray & Family…sorry to hear about your mother’s passing. She was a great lady and will certainly be missed. My condolences to all of Gloria’s family! Sorry to hear of Glorias passing. She will be missed by all those who knew her. Thinking of you at this difficult time. Murray,Bert and Family. So sorry to hear of Gloria passing.She was a great lady and will be missed by all that knew her. Murray and family……I was very sorry to hear of Gloria’s passing, she will be missed by many. May you find peace and comfort in the loved ones who surround you during this difficult time. Thinking of you. Dear Murray: These past several months have brought us sadness and sorrows by the loss of our family and friends. Your Mom was a dear friend to my mother, Rita. Mom will be sadden to hear of Gloria’s passing. Gloria was like a sister to her and spent many good times at our house when we lived on Milton Road. It was not long ago that Gloria and I had a chat, can’t remember where, but I always will remember her caring nature. She was so proud of you and the grandchildren and always mentioned them when we spoke. My sincere condolences for your loss. We were so very sorry to hear about Gloria.She was a wonderful mother and grand mother and so very proud of you all.She always had a smile on her face and time to talk.Please know that we are thinking of you all.Take care of each other and cherish your memories.R.I.P. Gloria. Murray and Family,I am so sorry to hear of Gloria’s passing.She will be greatly missed.May she rest in peace. Murray and boys, very sorry for your recent loss. Please know you are in our thoughts. Murray and family, We are so sorry to hear of your mom’s passing. Thinking of you at this very difficult time. I was sorry to hear of Gloria’s passing. I always liked her and found her very friendly. My thoughts and prayers are with you all at this most difficult time. Murray we our sorry to hear of the passing of your mom…our thoughts are with you and your family during this difficult time. and prayers are with all the family. We were so sorry to hear of your Mom’s passing.Our condolences to you all at this sad time. So sorry for your loss. Know that we are thinking of you. God bless. Murray & Family: Thoughts are with you at this difficult time. Always had a chat with Gloria. Mom and I were saddened to hear of your Mom’s passing. Cherish the love she had for all of you and hold precious memories close your heart. Our thoughts and prayers are with you as you travel this difficult road. May knowing your Mom is at peace and that many others share your loss help to heal your hearts. To Gloria’s family our thoughts are with you all at this sad time,with the help of family and friends you will get through this difficult time just remember all the happy days that you had together. Sincerest condolences on the loss of your mom Murray, she was a lovely lady. Keep your memories close. Bob and I are very sorry that you’ve lost your Mom and we’re sending our most sincere sympathy to you and your family at this especially difficult time of year. MURRAY & FAMILY ,THINKING OF YOU & YOUR BOYS . found her very friendly.I heard prayers for her in church on Sunday,so know that many of us share in your sorrow.I used to see her often when I taught in Mount Pleasant. We are very sorry for your loss. Please know we are thinking of you and your family during this sad time. To Gloria,s Family so sorry to hear about your loss Our thoughts and prayers are with you all. deepest sympathy to Michael Crystal and all the family; especially Margie .fondest memory of your Mom dippin” ice cream at Dannies and had lost my Dad Dec 25 and your mom would always lift my spirits and a long time friend i” d always look for when I would return on visits over the years . I will light a candle at LOURDES for her and all of you . She is eternally happy now always near. Bettty and family. Murray and family: Our thoughts and prayers are with you all during this sad time. Keep the memories of your mom and grand-mother in your hearts. She loved you all very much and was so proud of each and every one of you. God Bless! We are so sorry to hear of Gloria,s passing. She was a wonderful Mother & Grandmother & friend & will be surely missed by everyone.To her sister & brother -you will have many memories to keep her alive in your hearts. Lloyd & Barb. My deepest sympathy to the family on the loss of your mom. Stunned to read of the passing of Gloria. She was such a beautiful lady. So sorry to hear of your mom`s passing , great lady and will be missed. Dear Murray and family, Sorry to hear about Gloria she was a great lady, always smiling and always ready to lend a hand our thoughts are with you. My thoughts and prayers are with you all at this difficult time.Gloria was a good friend and she will be missed but not forgotten.Hugs to you all. I want to extend my deepest sympathy on the loss of your loved one. Your family is in my thoughts and prayers. Murray, I am sorry to hear about the loss of your mother. I worked with Gloria for a long while. You are in our thoughts and prayers. So sorry to hear about the loss of your mother. We will keep you in our thoughts and prayers. May she R.I.P. So sorry to hear of Gloria’s passing Bert and the rest of the family.,Our thoughts and prayers are with you.Mike & Sandy. Murray & family; I was very saddened to hear of your great loss,I knew your Mom for many years & always enjoyed our catch up chats of our younger years…..Gloria will be missed by many,you are in my thoughts at this difficult time. We were saddened to hear of your mother’s/grandmother’s passing. You will be in our thoughts and prayers in the next while as you grieve your loss. so sorry for your loss.our thoughts and prayers are with all the family…R.I.P. I extend my heartfelt condolences on your loss. May you find comfort in those around you who obviously thought a great deal of Gloria.